Hour by hour, day by day, Serfaus kept serving up the surprises, the delights, the jaw-dropping epic descents of which 50-year memories are made. You probably haven’t heard of Serfaus – neither it nor its sister villages of Fiss and Ladis have been written up in North American ski magazines. Out of the way they are, but don’t think they’re small, primitive or underdeveloped. This Tyrolean trio’s interconnected lift system forms one of the biggest ski resorts in Austria – 53 lifts stretching through five enormous basins along a chain of mountains. The resort offers nearly as much vertical and as high a peak elevation as its much better-known cousin and rival, St. Anton, barely 50 km away. On my visit there last March, everybody in the group agreed Serfaus-Ladis-Fiss have assembled literally the best lift system in the entire Alps. Those locals who survived eventually discovered something more lasting and lucrative.It started out small and modest, but it evolved impressively. Today literally no resort has more modern, faster or consistently excellent ski lifts – quads, six-packs, nearly all detachable high-speed, plus fast six- and eight-seat gondolas, several with heated seats. Even with 12,000 guest beds and peak crowds of 14,000, there just aren’t any real lift lines. Serfaus alone has three high-speed gondolas radiating from its base, plus one of Austria’s two underground metros running beneath the main street of the drawn-out town (honest – Vienna has the other). The wonderful Pezid skiing zone, itself bigger than a resort the size of Fernie, was opened just a couple of years ago with four new lifts. Pezid was the scene of our first descent. The five of us, Kurt, Mexx, Martin, Sven and I – plus photographer Martin Söderqvist, who would shoot from across the valley – hooked up first thing at the main Komperdell lift terminal complex above Serfaus. Another gondola ride brought us to a ridgetop where we could see the huge cirque below the Riefenkopf peak looming seductively like some scene from an Alaska ski flick. Kurt, one of only two mountain guides in the entire resort, assured us there’d never been tracks in its couloirs. Bizarrely after this pristine alpine ambience, the day’s-end piste-hurtle was an ice-and- slushfest, and we water-skied right up to the strategically situated après-ski bar at he base. The drinks flowed and speakers blasted Tyrolean skiing and seduction songs n this glass-enclosed outdoor bar, later onverted into a yurt-like enclosure through an enormous umbrella-roof. Eventually we ambled down the long village, a typically Tyrolean collection of chalet structures plus some historical buildings, such s a very old church, and working barns containing wintering dairy cattle. The next day Sven and I decided to cruise the entire lift system. Euro-skiers love these “ski safaris” in which they herd themselves from one end of a lift system to the other and back again. This usually entails a lot of boring, flat transit pistes, with lunch the main high point. But at Serfaus-Fiss-Ladis the prevailing terrain of steep ridgelines and huge bowls means that getting there and back again is nearly all fall-line skiing. Given the resort’s superlative grooming and often terrific cruising runs, one could follow Sven’s program via marked pistes, which is how 95 per cent of the clientele enjoys the resort. At one maintenance area we saw more winchcats in one spot than I’ve ever seen at a North American ski resort. On that note we checked out the resort’s steepest marked run, the 35-degree Dirittissima above Fiss, formidable in that day’s rock-hard conditions. Fiss, though, was not our favourite skiing, forming a congested cauldron at once unaesthetic and overbuilt with criss-crossing lifts and pistes. If you stay in Fiss, get out of the main bowl first thing in the morning. If in Serfaus, just pass through. It’s worth doing, because the skiing beyond Fiss is excellent and different again. The massive north side of yet another enormous ridgeline above the Urg Valley is dappled with broadly spaced pine trees, making for great flat-light skiing both on- and off-piste, since there are wonderful broad ungroomed slopes between the marked trails served by three high-speed lifts. As is universal in Austria, the whole resort is sprinkled with places to turn in for a break. These vary from modernist self-serve restaurants in major lift terminals to wooden huts converted from ancient alpine dairy barns. Our favourite became the Schalber Alm just below Komperdell, very rustic, with an excellent kitchen, reasonable prices, self-serve and sit-down-service sections plus a huge outdoor patio. 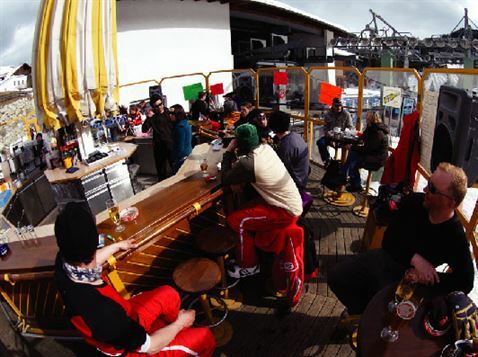 Serfaus also has to be among the most kid-friendly resorts in the Alps. First, the metro averts long walks and temper tantrums. The mountain’s original cable car is now a special lift just for kids, ensuring smooth and easy loading and nobody wandering astray. Serfaus’s kids’ program handles up to 1,500 a day and is centred at Komperdell, which gets the moppets up onto the mountain. There lies a large kids’ park with numerous magic carpets, dozens of features, age and ability-graded events, organized juice breaks at picnic tables and a couple of dozen instructors keeping it going. Usually I barely notice these things, but Kurt led us blasting straight through the complex because it formed a shortcut to some of his favourite tree skiing. Austria isn’t well-known for this, but there’s great and in places dauntingly steep tree skiing below the gondolas right above Serfaus, with an exit trail in the drainage below. That night it began to snow. The blizzard raged the next day and the snow swirled all the following night. We woke on our final day in Serfaus to the boom of Gasex cannons performing avalanche control, and could barely down our breakfast. Moritz and Nicole, a fine young couple who study at the university in Innsbruck and are buddies of Sven, allowed themselves to be lured up for the day. The two also produce a remarkable line of tuques (www.pinkbommel.de), called the pink bommel (pom-pom in German), which they design, hand-stitch and embroider. On the first gondola ride Nicole handed me a dark blue number embroidered with a lovely edelweiss—which actually fit my fat melon. I was torn between blubbering my thanks and staring in rapture at the deepening powder blanketing every square metre of forest and slope. Exiting the Lazid gondola above Komperdell, it was obvious we were in for an 80-cm day. We veered immediately off the cat-track onto a huge slope lined by the reassuring grey tubes of Gasex cannons. Because so much of Serfaus’s off-piste terrain overlooks marked runs, a lot of it is regularly avalanche-controlled. The day unfolded according to Sven’s earlier vision: out one lift, down the first massive slope in sight, runout to an obviously placed lift, glide on shaking off goggles and gloves, up the lift, down the very next slope, and on and on, with only a vague sense of direction and no goal in mind. Everything on every exposure was bottomless blower – pitch after pitch where Moritz’s tuques were the only objects in view. We’d regroup briefly at some flat spot, rock outcrop or traverse line, exchange maniacal grins, mutter a few redundant superlatives and push off. By 3:00 p.m. we were at 20 descents and well over 10,000 metres of vertical. 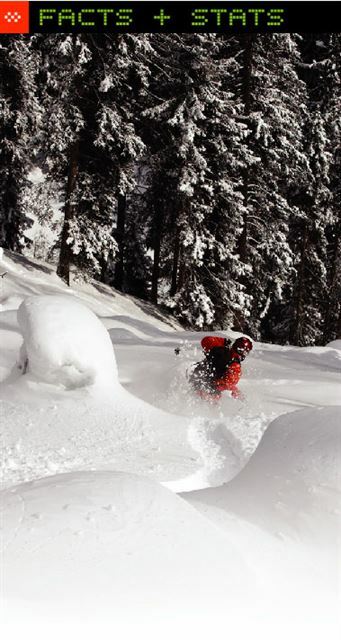 This was powder quality and vertical quantity that most Austrians insist can only be found heli-skiing in Canada. We were a long way from the B.C. Interior – but in Serfaus we felt right at home. The chamois’s head whips around. For an instant its liquid innocent eyes meet mine, then she rolls her eyes back and bounds into the woods. An unexpected moment of poetry in a lazy late-afternoon descent of rolling snowfields overlooking the village. It’s one of those in-between times when the last snowfall’s powder is almost gone and the first cirrostratus clouds signalling the next storm are just forming. The rest of the entourage had given up and headed to après-ski. The season’s first turns in spring corn – the real stuff, crisp and billiard-table smooth—redeem the day. Kurt Klinec hops the lip, thrusts his skis far out and begins arcing massive turns down the no-longer-quite-powder plastering the north-facing couloir. Kurt is fourth man down – after pro rider Martin Webrant, local snowboard instructor Mexx Falch and ace skier-photographer Sven Brunso – in an undertaking I never thought my middle-aged self would experience again: a first-ever recorded descent. It’s a huge cirque of parallel couloirs dropping 600 vertical metres into a massive bowl, and each of us has his own personal chute. Amazingly – bizarrely – this mountainside has sat in plain view of lifts for decades and is only 15 minutes’ walk from a recently built gondola. Nicole, Moritz and Sven scramble out of the gondola terminal, leap into their bindings, make one veering turn off the corduroy and are engulfed in waist-deep, heli-ski-quality blower. They spread out on the broad face, marked only by the big rounded curves of our last lap, and accelerate into terminal powder velocity trailing gigantic plumes of moondust. Three tuques and six gloves provide the only physical evidence of their existence. Turn… turn…turn…turn. LOCATION: The resort lies above the Inn River valley in the Drei Länder Eck of southwestern Tyrol province, Austria. MOUNTAIN STATS AN LIFT SYSTEM: Five enormous bowls, four major ridgelines, three main peaks, 53 lifts plus village underground metro, 185 km of marked pistes, over 20 mountain huts and restaurants. 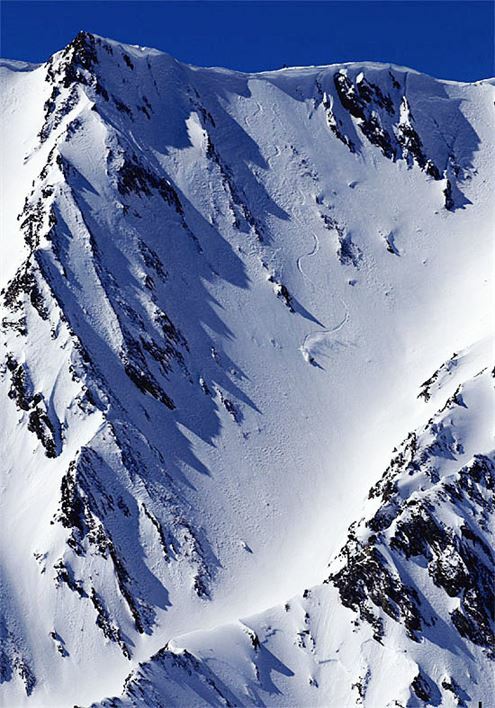 Peak elevation 2,770 metres, base elevation 1,200 metres, maximum continually skiable vertical approx. 1,400 metres. VILLAGES: Serfaus, Fiss and Ladis. Accommodation from B&B “pensions” and apartments to numerous family-run four-star hotels. 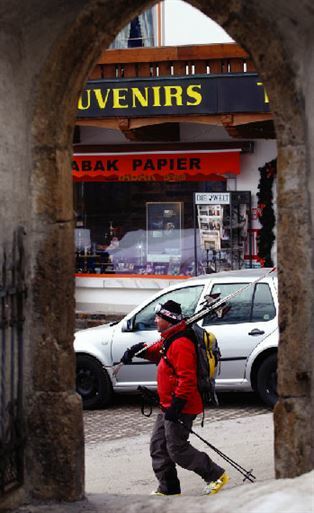 Serfaus is the largest village and has a full range of shopping, boutiques, restaurants and nightlife.